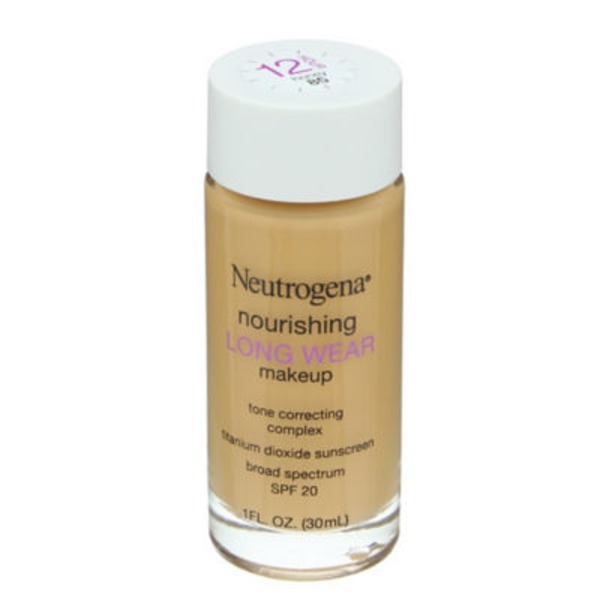 New Neutrogena® Nourishing Long Wear Makeup gives you smooth, even, long-lasting coverage as it works to actually improve skin's natural tone. The 12 hour long wear makeup instantly erases the look of skin imperfections as it provides natural-looking coverage. It has a Tone Correcting Complex—an exclusive blend of nourishing antioxidants, soy, Vitamins A, C, E, and light diffusing powders—and is clinically proven to provide skin tone and texture improvements in 4 short weeks. Beautiful day one, with even more beautiful results to follow. Directions: For Sunscreen Use: Apply liberally 15 minutes before sun exposure. Use a water resistant sunscreen if swimming or sweating. Reapply at least every 2 hours. Sun Protection Measures: Spending time in the sun increases your risk of skin cancer and early skin aging. To decrease this risk, regularly use a sunscreen with a broad spectrum SPF value of 15 or higher and other sun protection measures including: limit time in the sun, especially from 10 am-2 pm; wear long-sleeved shirts, pants, hats, and sunglasses. Children Under 6 Months of Age: Ask a doctor.